Chinese investor Rossoneri Sport Investment Lux has completed its £628m (740m euro) takeover of AC Milan, promising "significant capital increases". 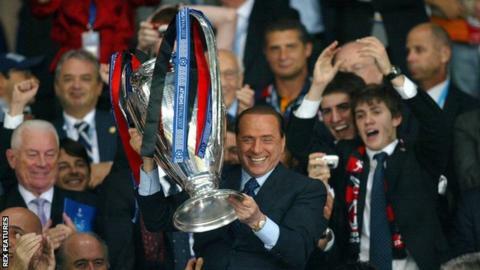 The Serie A club have been owned by former Italian Prime Minister Silvio Berlusconi since 1986. A new stadium is on the new owners' agenda, according to the club's general manager Marco Fassone. "We want to give AC Milan a stadium in the short term," he said. AC Milan and fierce rivals Inter Milan, also Chinese-owned, rent the 80,000-seat San Siro from Milan's city council. "We know that in Italy it cannot happen straight away," added Fassone. "Whether it's San Siro or a newly built stadium, as long as the club can have its own stadium." AC Milan have not won Serie A since 2011 and finished seventh, 10th and eighth in the past three seasons. They are sixth in the league, 20 points behind leaders Juventus.